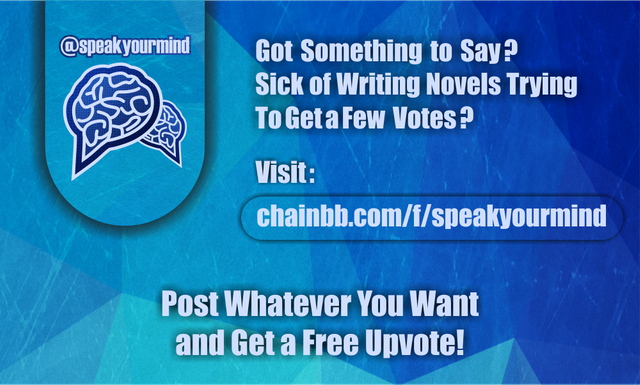 Post on chainbb.com/f/speakyourmind and get a free upvote! What can I expect after posting? A vote. Size, reward amount, etc. is not guaranteed. Votes will not be immediate and will be reviewed. To show everyone there is value to content that doesn't take 90 minutes to write. Promote chainbb and the great work @jesta has been doing to build a Steemit alternative. Giving out free votes is fun. Any word and post this guy does needs to be resteemed. You dont need to work hard to get rewards. Just be smart as him and you can be rich. hello i new user in steem it plss folow me back. Thank you, for kindly pointing this out to me. Great platform @speakyourmind chainbb is really great all we need is just a little publicity so more person will join the platform and we will all enjoy using it. hope the posts will not be coming into our steemit blog? What of post on steemit, will the be any votes? @speakyourmind. Congratulations @speakyourmind! You received a personal award!